Incidentally at a council committee meeting on 30/10 EG councillor Peter Taylor proposed a motion to have Runnymede Borough Council review their pro-Heathrow expansion stance . The casting vote meant that this was not passed. The Observer has been told that Hammond, the MP for Runnymede and Weybridge, made clear the attitude he would take during the election campaign to a third runway at Heathrow when he spoke at a public meeting 10 days ago in Egham, in his Surrey constituency. “When asked what his opinion was, the foreign secretary said he was against a third runway and there was a huge round of applause,” said a source who was at the meeting. Those attending voiced their anger about the extra noise and harm to the environment, and concerns about recent trials of new flight paths into Heathrow. Last night Johnson – who was recently selected as Tory parliamentary candidate for the west London seat of Uxbridge and West Ruislip – also said he would have no qualms about voicing vehement opposition to Heathrow expansion during the election campaign, whatever the official Tory party position might be. The mayor told this newspaper: “I am wholly opposed to Heathrow expansion, as I have been throughout my six years as mayor. A third runway would be catastrophic for London and Londoners.” Johnson said he remained in favour of a new, four-runway airport in the Thames estuary. Davies has ruled the option out. The mayor believes his idea, nicknamed “Boris Island”, can be revived and is the only way to solve the capacity issue while avoiding unacceptable environmental effects on Londoners. The issue threatens to become a battleground between rival candidates to lead the Conservative party in future. Other leading Tories with south-eastern constituencies who have spoken out against a third runway at Heathrow include the home secretary, Theresa May, who is MP for Maidenhead; the international development secretary, Justine Greening, who is the member for Putney; and the Northern Ireland secretary, Theresa Villiers, MP for Chipping Barnet. The Conservatives went into the last election ruling out expansion of Heathrow, but the prospect was revived in the middle of the parliament after pressure for a rethink from the chancellor, George Osborne. 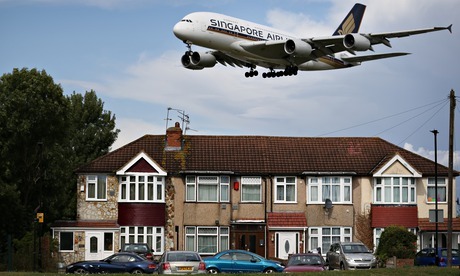 Government insiders and aviation experts now believe that the extent of opposition to the Heathrow option from politicians of all parties may tilt the advantage in favour of expanding Gatwick, which would have less environmental impact. The Conservatives and Liberal Democrats both opposed any expansion of Heathrow at the 2010 election. David Cameron ruled it out, saying: “No ifs, no buts, there’ll be no third runway at Heathrow.” Ed Miliband voiced opposition when he was secretary of state for climate change. However, in September 2012 ministers set up an independent commission chaired by Davies to review the issue. The commission has already said there is a need for one additional runway in the south-east of England by 2030 and has three options: a third runway at Heathrow, lengthening an existing runway at Heathrow, and building a second runway at Gatwick. Heathrow and Gatwick were asked to submit updated proposals to the commission in May of this year. Davies is due to deliver his final report in June. A report commissioned by Gatwick and drawn up by the environmental research division of the Civil Aviation Authority will say this week that the number of residents and schools affected negatively by noise as a result of Heathrow expansion would be much higher than if Gatwick were developed. John Stewart, chairman of AirportWatch, an umbrella group for organisations fighting “unsustainable” airport expansion, said the political obstacles to expanding Heathrow were considerable and had become greater since Johnson had been selected for a west London seat. “Gatwick is coming up on the rails because politicians realise it would deliver economically, and also that it is more politically deliverable than Heathrow,” he said. Senior Liberal Democrats, including the business secretary, Vince Cable, who is MP for Twickenham, are also against the expansion of Heathrow, as are several Labour MPs with west London constituencies.